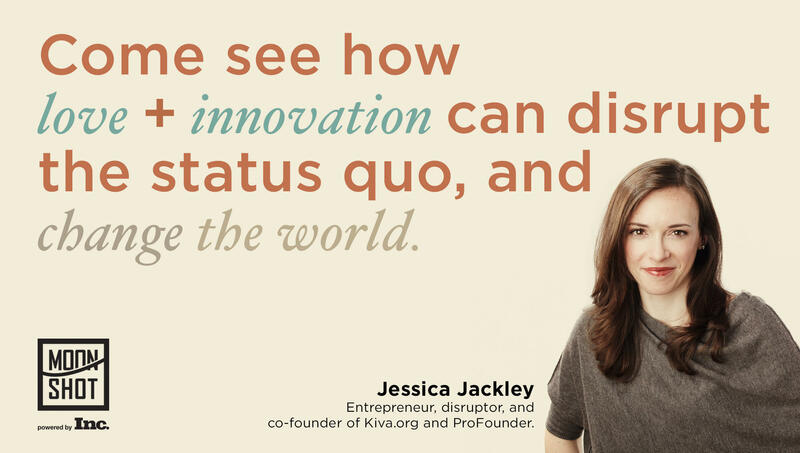 Jessica Jackley saw that global poverty needed a faster, more connected solution. Attend our latest Moonshot Speaker Event, and discover how a little compassion, and a whole lot of creativity, led Jessica to reimagine how everyday people can alleviate poverty in the third world. Jessia Jackley embodies the Moonshot mission. Not only does she possess great vision, but also the courage to transform that vision into action. Her remarkable work over the past decade has focused on financial inclusion, the sharing economy and social justice. She is best known as a cofounder of Kiva, the world's first peer-to-peer microlending website. Kiva lets Internet users lend as little as $25 to individual entrepreneurs, providing them affordable capital to start or expand a small business. Once that $25 is paid back to the lender, it can be invested in other entrepreneurs - again and again.